See a map of the Cairo area in 1920. From 1882, Egypt was ruled in name by a Khedive, who was from the same family as Muhammad Ali. In fact, however, Egypt was actually ruled by the British consul-general, Evelyn Baring, the Earl of Cromer. The administration of Egypt was divided between the British and the French, and the Egyptians had little say. Officially, the purpose of the dual-control system was to oversee the Egyptian economy, which would allow the Europeans to ensure that the Egyptian debt was paid off. The Europeans continually made promises that they would pull out of Egypt once affairs were in order, promises that were never kept. Heliopolis was designed by a Belgian baron, who built himself a home which is arguably the ugliest building in Egypt. It is designed in the style of a Hindu temple with Greco-Roman highlights. It is supposedly haunted. CR. The arrival of the Europeans in Egypt remade Cairo. The modern quarters of the city were taken over by European arrivals who built European shops, and built exclusive clubs. The new quarters of the city grew into vast blocks of apartment buildings. 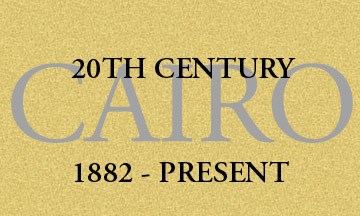 Two new sections were added to Cairo: Maadi, to the south, was built as an exclusive European enclave shortly after the turn of the century, and Heliopolis, to the northeast, was built in the 1910s. These areas were built with the latest in modern conveniences: running water, electricity, and a tramway that connected Heliopolis to central Cairo. By contrast, the older sections of the city were not modernized. The Khedive Tewfiq died in 1892, and his son Abbas Hilmi replaced him. Abbas Hilmi believed that he didn't need the Europeans to tell him what to do, as he was European educated and knew as well as any of them what needed to be done. The Europeans, however, openly threatened to depose him if he tried to act independently. He backed down, and so ruled until 1914. Such threats did not go unnoticed by the Egyptians, many of whom began agitating for the Europeans to leave. The upper class were able to send their children to school in Europe: many of these children returned to lead nationalist movements against the Europeans. Such revolts were limited in scope, however, because there had been no direct action taken against ordinary Egyptians. This changed in 1906. A group of British soldiers decided to use a small village in the delta called Denshawai as a forum for engaging in pigeon shooting. The pigeons were raised by the villagers who sold them, and they depended on the profit as their main income. The soldiers had done this sort of thing before, and when they returned, the villagers attacked them with sticks. None of the British soldiers were harmed in the attack, however, one soldier had run back to camp to tell his officer what had happened, and died of heat stroke. The punishment was severe: four of the villagers were hanged, two were sentenced to life in prison, and most of the others were to be flogged in public while the entire village was forced to watch. This was the event the nationalists had been waiting for. An outcry of public sentiment against occupation went up in villages all over Egypt. The British Parliament was now ruled by liberals, and so they allowed the creation of an elected Egyptian parliament. Many of the parliamentarians were opposed to the occupation, and began agitating for terms of a British withdrawal from Egypt, which was now twenty years overdue. Since 1882, Cairo has grown rapidly, almost all of the growth taking place to the west of the old city. The new city is seen here from the Citadel. CR. In 1914, World War One broke out. Egypt found itself in an awkward position: the Ottoman Empire, of which it was a province, was fighting the British and French, who occupied it. At this point, the Europeans stepped out and took control of the country. The khedive was deposed in favor of his uncle, Hussein Kamil, who was declared sultan of Egypt. Egypt was then officially declared a British protectorate, and the resident Turks, Germans and Austro-Hungarians were forced into internment camps. Most of the nationalists were forced into exile in Malta. As a British protectorate, Egypt was forced into supporting the British war machine. English troops flooded into Egypt, as well as refugees fleeing the war in Anatolia and southern Europe. The influx of new people created massive shortage: as food prices rose, rationing was implemented, and famine broke out. The war itself barely touched Egypt: the sole casualty on Egyptian soil was killed by a bomb dropped by a zeppelin, a woman who had been walking her dog. At the war's end, the Khedive died, and Ismail's twelfth son, Fuad, became Khedive. At the war's end, Egyptian politicians went to London to demand that the British withdraw immediately. The request was denied, and opposition again broke out in Egypt. The main activists formed themselves into a group called the Wafd, which means "delegation," The nationalists were led by Saad Zaghlul, a politician who had been a friend of Lord Cromer. They led protests and actively worked against the British. Many of them, including Saad Zaghlul, were arrested and deported. The Egyptians responded with violence, taking to the streets and burning buildings associated with the British. Widespread strikes, riots, and terrorism brought the country to a halt. In response, the British finally agreed to pull out in 1922 and grant Egypt independence ­ with certain conditions. The British set four conditions on Egypt that nearly amounted to a kind of underhanded control of the country, despite its independence. First, the British could dictate Egyptian foreign policy, and force Egypt to go to war in order to protect British interests (i.e., the Suez Canal). Second, the British were responsible for the administration of the Canal, which was officially classified as "the security of the communications of the British Empire." Third, Britain was allowed to maintain its business and strategic holdings in Egypt, and fourth, Britain and Egypt would be jointly responsible for the administration of the Sudan protectorate. With the British withdrawal, Fuad became King of Egypt. But the king was more interested in the ways of Europe than in the ways of Egypt. Raised as a member of the Turkish nobility, he spoke Arabic haltingly at best, and preferred to speak French at home while referring to the majority of his Egyptian subjects as "cretins." The King was given wide sweeping powers that left him a near-absolute monarch. The al-Rifai Mosque, completed in 1912, serves as the final resting place for many of Egypt's royals. CR. The tomb of King Fuad, who ruled from 1922-1936. CR. The tomb of Egypt's last King, Farouk, who ruled from 1936-1952. He died in exile in Rome in 1964. CR. Al-Rifai Mosque also has been the last resting place of both of Iran's Pahlavi Shahs. Reza Shah was interred here during World War Two, and Muhammad Reza Shah, deposed in the 1979 revolution, is buried here. CR. In 1924, the nationalist Wafd party was brought into power in general elections, and Saad Zaghlul became Prime Minister. Though he and the king did not like each other, their political fighting kept Egyptian politics somewhat even handed: Zaghlul could call the mobs into the streets in order to force the king's hand. After his death in 1927, however, the king was firmly in control, and used the organs of Egyptian political life to support his own interests. The English were still in Egypt in significant numbers, and it was during this time that such derogatory terms as "wog" (which stands for "worthy oriental gentleman," but is in fact an insult) were coined. The British engaged in such cross-cultural activities as excluding the Egyptians from their clubs, and knocking the fezzes off of "wogs" for sport. In 1936, King Fuad died, and his son, Farouk, came to power at the age of 16. At first, he was none too pleased with the limits placed on his power by the British who were still in the country. Egypt was supposed to be independent, and the king should also be independent. When World War Two broke out a few years later, however, his will was tested. The Egyptian government, in the eyes of the British, was not doing enough to support the war effort. In 1942, the British, fearful that King Farouk (whom the British ambassador still referred to as "the boy") was about to appoint a pro-Axis prime minister, took steps to change the king's mind. The British drove up to Abdin palace in tanks in the middle of the night, stormed the palace, and, at gunpoint, ordered the king to appoint their choice as prime minister. The insult was felt by all Egyptians, and especially by the Egyptian army. Wartime Cairo was not the place for a large scale uprising against the British. The Egyptians held on, and, like after World War I, after World War Two ended, many Egyptians felt that it was time that the British finally left. In 1948, the British pulled out of neighboring Palestine, and the Egyptians, along with other Arab forces, attacked the infant state of Israel and were badly beaten. The British did not aid the Egyptian forces, and the King seemed to be more interested in high fashion and high society than in politics. Ismailiyya Square was filled was people after the revolution in 1952 to celebrate the birth of the republic. It was renamed Midan al-Tahrir (Liberation Square) soon after. Today, it is the transportation hub of the city of Cairo. CR. Finally, in 1952, things came to a head. A young army officer named Gamal Abd al-Nasir (also spelled Nasser) and a group of military officials who called themselves the Free Officers took power in a surprise coup on the night of July 22. Four days later, on July 26, King Farouk, his wife and their infant son sailed from Alexandria on their yacht, never to return. Egypt had become a republic. Nasir wanted Egypt to be rid of the British, but he also knew that the British would be very concerned about the revolution, so he was respectful of the British who remained, and worked on other problems that were of a big concern to the Egyptians. One of them was money: Egypt was in debt to the British, among others, but the Suez Canal, which was a source of money, was still essentially British territory. British pilots guided the boats through the canal, British troops oversaw the canal, which was still owned by a British company. In 1956, on the fourth anniversary of the Revolution, Nasir announced that Egypt was taking control of the Canal, and that the British forces were to leave Egypt. The next day, Egyptian officers showed up to run the Canal, taking over from the British troops who had been in charge. The British were unhappy about this, because they were convinced that the Egyptians couldn't run the Canal properly. The British then conspired with the French and the Israelis to take the Canal back, and launched an attack on Egypt. However, the Americans and Soviets came to the aid of the Egyptians, and soon the battle ended quickly thereafter, with the Canal safely in Egyptian hands, and the British having left Egypt once and for all. Flush with success, Egypt began worrying about another problem in the region: Israel. After the war in 1948, the state of Israel had been established as a formidable military power, capable of beating the armies of the Arab countries around it. The sting of defeat had not been forgotten. And so, in 1967, Egypt conspired with Syria to launch a surprise attack on Israel. However, before either country could mobilize its forces, the Israelis, who had gotten word of the planned attack, launched their own attack. In just six days, Israel managed to destroy the entire Egyptian air force, and had occupied the Sinai Peninsula all the way up to the Suez Canal. The shame of defeat was unbearable. President Nasir tried to resign, but the Egyptian public reaction over his resignation was too strong, and he was convinced to stay in office. However, Nasir, a powerful speaker and strong leader both in Egypt and the Arab world, was never quite the same after the 1967 war. He died in 1970 of a heart attack, just days after negotiating a peace between the King of Jordan and the head of the Palestinian rebel group who had tried to take over that country. Gamal Abd al-Nasir, President of Egypt 1954-1970. Nasir remains an incredibly popular figure in Egypt, and his picture can be seen all over Cairo even today. Nasir's successor was Anwar al-Sadat, a man about whom little was known at the time. Sadat was in many ways Nasir's opposite: Capitalist where Nasir had been socialist, quiet and refined where Nasir had been firey and flamboyant. Sadat knew that Egyptians were suffering from low spirits, and in October 1973, the Egyptian armed forces launched an attack on the Israeli forces occupying the Sinai. Although history has recorded the 1973 war as a victory for the Israelis, the Egyptian spirits were dramatically lifted by the fact that their troops succesfully crossed the Suez Canal and that, when the war ended, a peace settlement was negotiated in which the Israelis agreed to give the Sinai back to Egypt. Sadat, however, went further. In 1978 he signed a peace treaty with Israel, the first Arab leader to do so. This decision angered many Egyptians, who felt that the Israelis were not trustworthy, and that Sadat had betrayed the Arab cause. Furthermore, Sadat had taken steps to neturalize the power of the Muslim brotherhood, an Islamist group that had a stated objective of turning Egypt into an Islamic republic. Sadat was good friends with the Shah of Iran, whose country rebelled against him and became an Islamic republic in 1979, and did not want the same thing to happen in Egypt. Sadat ordered the arrest of hundreds of people who were suspected of anti-government activities in the late 1970s, many of whom were never shown the evidence against them. In 1981, Sadat was assassinated at a military parade in Cairo by a group of army officers who were also members of the Muslim brotherhood. He was succeeded by his new vice president, Hosni Mubarak, who has taken the middle ground compared to his predecessors. Mubarak has been the president since then, and has quietly taken steps to move Egypt away from economic hardship and to correct some of its social problems, all the while taking care not to offend or alienate the secularists or the Islamists. Since 1952, Cairo has been on the course that has largely shaped it into the city that it is today. With the rising of Nasir's socialist politics and Sadat's capitalism, Cairo became the dream of young men from the country. They would move themselves, and often bring their entire families with them, to the city in search of work. New housing projects in the east brought the former oasis of Heliopolis into the midst of the sprawling city. Many of the poorer families were reduced to living in the cities of the dead, the large cemeteries whose mausoleum structures provided basic shelter for millions of people. To understand the current situation of Cairo, next we will look at the modern city, and look at how some of the current problems and challenges of this city have developed over the last few decades. See a map of the Cairo area in 1950.